This is an outrageously long post, and I’m sorry about that, but I had a lot to share and this blog is as much for me as it is for all of you. So snuggle up with a warm beverage and I’ll tell you the tale of my hernia repair. It was all laughs and yucks like most of our appointments with the band of merry medical professionals that saved Derek’s life. But it was slowly sinking in for me that a hernia meant another surgery. 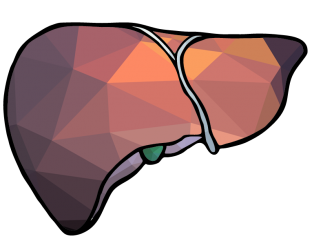 One year out from the liver transplant and I had mostly forgotten the pain of major abdominal surgery, but the memory of not liking the pain was still pretty fresh. This would be different. A little incision to put the patch in, no intubating, a day surgery. I’d leave with an ice pack and binder which is kind of like a dumpy looking corset with velcro. No. Big. Deal. But I was still freaking out. Let me be clear that if space and time was turned on its head and I somehow had to go back in time to give up 60% of my liver to Derek again, I would do it. No problem. I would be scared and I would not like the pain, but I would do it. 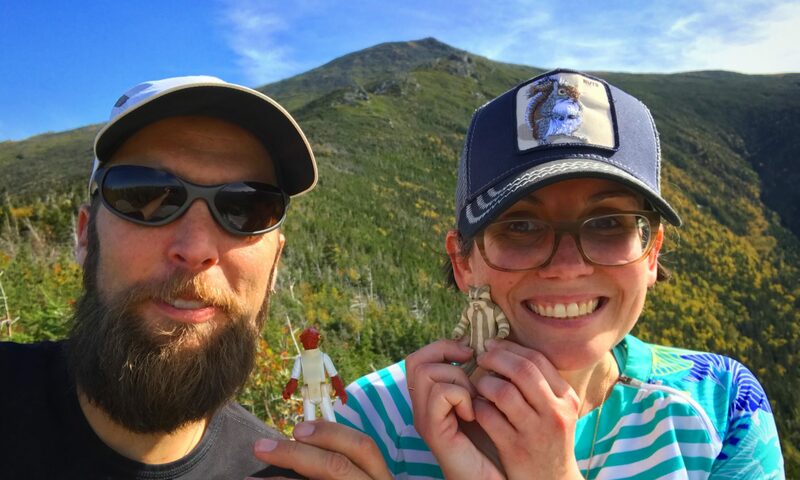 It would be even easier the second time around, provided I remembered that Derek eventually getting a new liver would mean that my dear husband would turn into Super Derek; full of life and able to run long distances. I just didn’t want another surgery or another recovery. Again, minor incisional hernia repair is not a big deal, it’s a basic surgery with a non zero chance of recurrence, but I would have the best surgical team who knew me inside and out–nyuk nyuk–and would be working hard to make sure this would get fixed. Ha ha ha! That won’t happen. This is a routine, out patient, hernia repair. It would be painful and require recovery, but let me reiterate, it was: No. Big. Deal. The day before my surgery I met with my surgeon to sign consent papers. We talked again about her plan. She would open the scar near the belly button and fix that hernia with a small, half dollar sized patch. She would also open up a small hole in the painful spot near the top of my scar and check to see if there was a hole that needed fixing. No hole? She would close that back up and I’d be all set. She marked the spots with a pen, and assured me we would talk again before I was wheeled into the operating room. I asked if it were possible that there were little tiny holes all along my incision, as her husband and Derek’s surgeon, had mentioned. She was doubtful, but said that she would make sure that any issues she found would be addressed. I woke up early on Wednesday, October 21st. 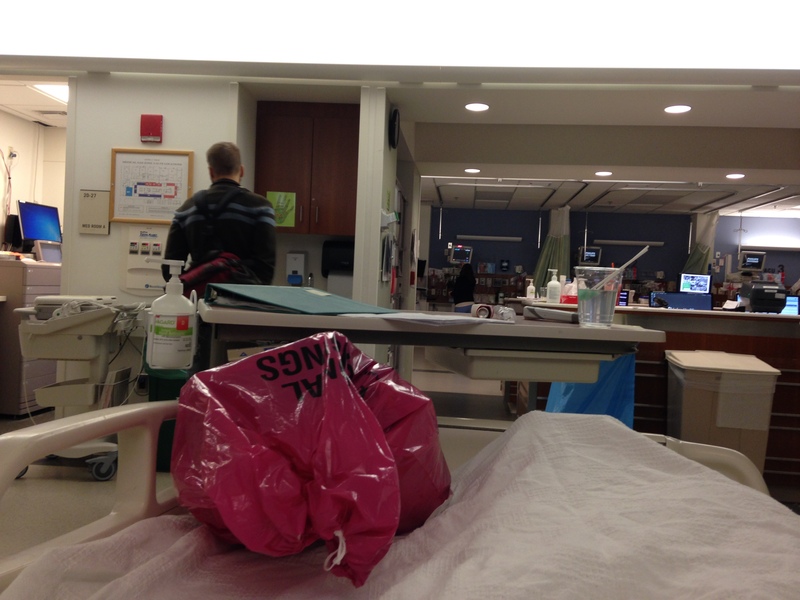 I packed a little bag for Derek to hold for me while he waited for me to get out of surgery. It had a pair of underwear and feminine hygiene products because if last time was any indication, I would be starting my period early. I also packed my phone charger. Now, why would I do that? Because in the back of my mind I was thinking, there’s a chance they won’t let me leave for some reason. And I’ll want my phone as a distraction. This is the nature of people like me. I imagine the worst, plan a little bit for the worst, and hope for the best. Note that I didn’t go nuts with this little emergency bag, because this was going to be an easy little surgery. Nothing like giving up part of my liver and my whole gallbladder. We got to the hospital and I had a great pre-op nurse. She was very fun and told me she would be my nurse when I came back to the pre-op area after surgery. The nurse anesthetist arrived and she was also very fun and friendly. 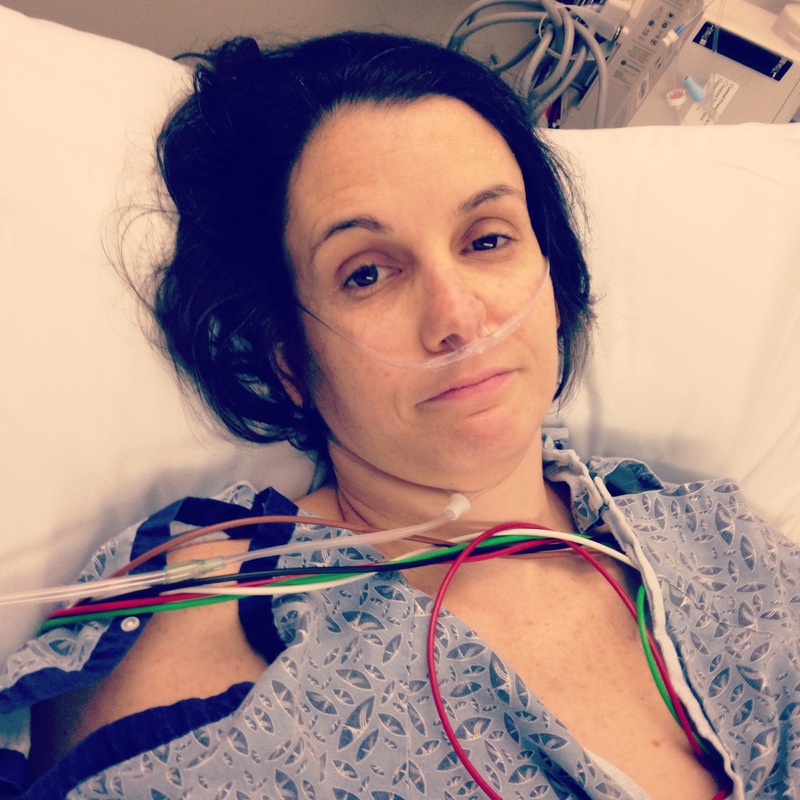 I explained that post surgery I get nauseous–nauseated?–and that morphine and oxycodone are not my friends. She listened carefully and thought for a moment. She decided to give me an anti-nausea patch behind my ear and said she would discuss with the surgeon a better idea for pain management. The bonus of having a recent surgery is that I have past experience and can provide guidance for what might work. I can’t stress enough how important it is to build a quick and honest relationship with your anesthesiologist. Their job is to make sure you are ok and as pain managed as possible. That doesn’t mean you’re a 1 out of a possible 10 on the pain scale. More like a 3 to 4. Painful, but manageable. So honesty is the best policy here. If you’re a wuss about needles, tell them. If you feel pukey after you’ve been put under or when you travel in a car, let them know. My transplant nurse arrived, and then my surgeon. She marked up my stomach with a marker and discussed my anesthesia plan with the nurse anesthetist. They both agreed that I would need to be super relaxed and completely unconscious so she could feel for the hernias and she mentioned her thought that a mix of Tylenol with codeine and lorazepam should be a good plan for oral pain management after I got home. The Tylenol would be a little easier on the stomach, the lorazepam would act as a muscle relaxer and anti-nausea medication. The nurse anesthetist then began putting the IV in my hand that would deliver my meds during surgery. It was highly unpleasant, but mostly because of the novacaine. Novacaine is such a racket. It’s supposed to numb things, and it does, but the needle that they use to get it in you manages to be super ouchy. 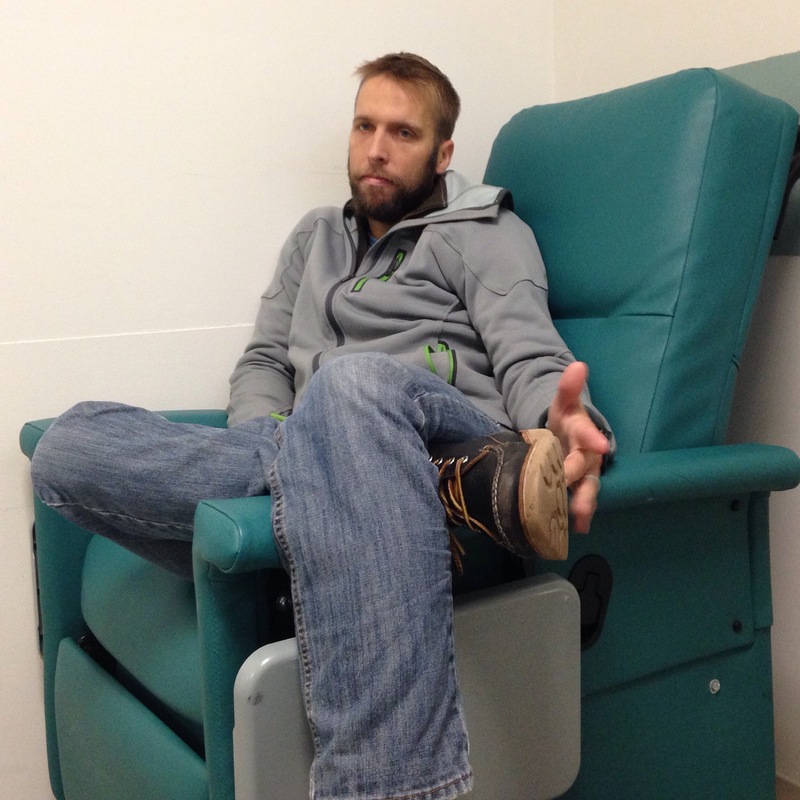 Derek in pre-op, sitting in what he calls the most uncomfortable chair ever. Being a goof before surgery. Once that was taken care of, some sedatives were administered and this is where it gets foggy and I have to rely on Derek to give me some indication of what happened. I began laughing and making jokes and then asked if I’d been given something. Yup. Can’t get anything past me! I am told I was then wheeled into surgery. I remember being in the hallway and seeing Tom, our favorite PA from the liver transplant days (See his smiling face here) and being thrilled he was there. I then remember helping the nurses get me onto the operating table, marveling at the gigantic lights above me and then…nothing. My next memory is foggy. There was a mask on my face, I was asked if I was in pain, and I was so I nodded. It hurt very much. Then, out again. Occasionally I heard voices. I remember blinking and my surroundings looking very familiar. Then out again. At some point I struggled with all my might to break through to consciousness. I opened my eyes and looked around. I was in the F#&%-ing PACU. A nurse was smiling and standing next to my bed. Through the mask I asked, “Am I in the PACU?” She removed the mask. Yup. This is definitely the PACU. Oh hey! It’s me in the PACU! Don’t I look positively thrilled? I can’t tell you what kind of drugs I was on at that point. Derek tells me when they switched me over to a pain med I could administer myself, two nurses had to be present to remove whatever it was I was getting. They had never heard of it, it was a controlled substance because it was locked up, and they determined that the remainder needed to be disposed of. Let’s just say it was the good stuff and as a result, the revelation that my worst fear had come true was…not so bad. That’s what they don’t really tell you about pain meds and that you likely won’t understand until you’ve experienced them: pain meds do not really get rid of pain, they make you not care that you’re in pain. You also won’t care that your routine hernia surgery is apparently not so routine and you’re being admitted to the hospital. Derek arrived then? Later? Maybe he’d been there for a while. When I finally acknowledged his presence, he told me I asked if he’d been waiting long and then I apparently apologized over and over again for taking so long to wake up. My voice was tiny and weak, the mask had been removed but I had an oxygen tube thing in my nose. He explained that the surgery went well but that I did not have one or two hernias, as previously thought, but many hernias. All along the incision were tiny little holes and a thin spot that connected them. When my surgeon discovered this, she made the decision to open up most of the incision so she could suture my abdominals back together, this time tighter, reinforcing everything and making sure I didn’t bust through the thin spots. She also decided to put a very large patch over my small hernia near the umbilical. Like softball size. Remember how it was originally going to be the size of a half dollar? Nope. My zipper scar had been unzipped, rezipped and I was being admitted to the hospital for an undisclosed number of days. Delightful. Oh hi there green sponges on sticks, please provide the least amount of useful water to me when I am so unbelievably thirsty, I’ve missed you ever so much. I was admitted on a Wednesday. I remember bits and pieces of my time in the hospital. I was on a patient managed drip of dilaudid which was far superior to the morphine from last time. No vertigo, no disorientation. Just super duper sleepy. I asked to walk around a few hours after arriving on the 6th floor much to the surprise of the nurses, again. I was on an IV drip of fluids and I was drinking a lot of water because dilaudid makes your mouth dry. I didn’t have a catheter this time and so peeing was essential and difficult. Derek stayed with me the entire time, helping me out of bed and to the bathroom multiple times throughout the night, and sleeping on a cot next to my bed. (He says it’s the best he’s ever slept in that hospital.) Good thing I remembered the trick of how to get up out of bed with no abdominal muscles, but it still hurt, and every time I realized I had to pee it was almost too late. There were a lot of close calls, but I managed to make it to the toilet just in the nick of time. I started my period Wednesday night, because of course I did. But I was prepared so I didn’t need to use the hospital issued gigantic underpants and maxi–and I do mean —>maxi<—pad. Yay me! The young man with the adorable man bun who was my nurse assistant for the evening was un-phased when I warned him that my bathroom time would look a little unpleasant, but that it was all good. The dilaudid gave me brief moments of lucidity at which point I would attempt to text message people only to find that I had fallen asleep mid conversation or more often mid text. I decided at some point that it would be a super idea to make a Dubsmash for my friend with Derek’s help. It was that scene from Airplane when Leslie Nielsen explains to Julie Hagerty what a hospital is. I was Leslie, Derek was Julie. I easily managed the scene, no problem. But then I watched it. I started laughing and oh holy swiss cheese was it painful. There was something about Derek in it that was comedy gold. He is perfect at deadpan. I couldn’t stop laughing. I was screaming in pain and laughing. Derek took the phone away from me which was a wise choice. I still can’t watch it without cracking up. Better than a central line in my neck. Gotta look on the bright side. Drawing pictures to entertain me. My lovey sleeping on the cot next to me. One if by duck, two if by sea. I was eventually moved to oral pain meds after using a minute amount of the dilaudid–no risk of dependency for this girl–I then slept some more. They discharged me on Friday afternoon which Derek says is a testament to my badassery. In his mind, I had just had the equivalent of a live donor liver surgery, but this time they left the liver. I would estimate that from Wednesday, October 21st to the following Monday or Tuesday, I remember about a total of 5 hours. Seriously. I slept, a lot. I ate, very little. 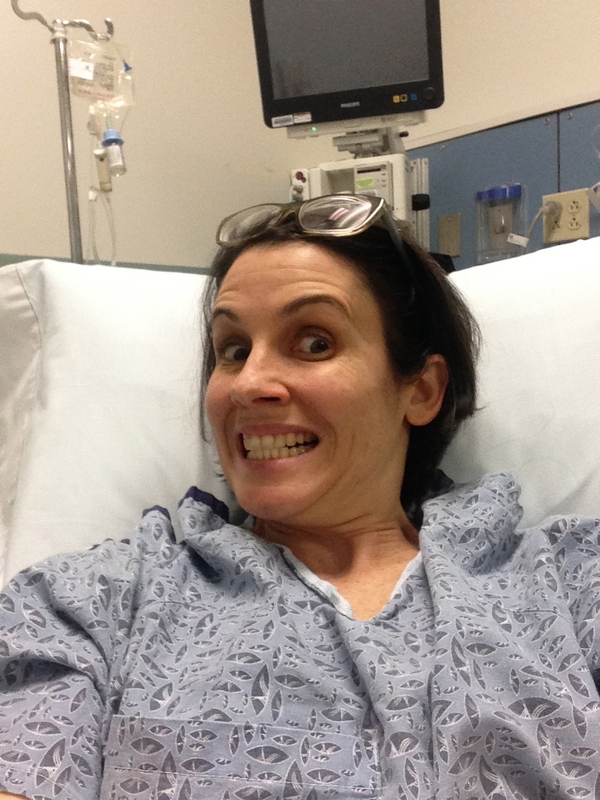 If you recall from my last hospital experience, getting my body to remember how to poop was a challenge. It finally figured it out about a week after surgery. It was a pretty bad day when my body did remember the process of waste removal, but I started to feel a bit better. I had another recurrence of gastritis, but it was milder than last time. I began drinking a weird concoction of diluted unfiltered apple cider vinegar and maple syrup–which I think is delicious–and I started to feel better in a few days. I am a firm believer in the placebo effect, if nothing else. Today I am 3 weeks post surgery. Sneezing and coughing is still outrageously painful, but light laughing is a bit better. (That whole thing that laughter is the best medicine is probably true for people who haven’t had their abdominal muscles stitched up. If I could have laughed without severe pain, I think I would have been in a much better mood.) I still walk a little hunched over sometimes, and my abs feel like they’ve been getting a constant work out, though I assure you, they haven’t done much of anything. All my body wants to do is stretch and sometimes, involuntarily, it attempts to, and I have to violently stop it from happening. It is very unsatisfying. Derek has been taking good care of me, and I’ve been letting him, mostly. I’ve been trying to cook some of our meals, but I need his help to lift our stupid Le Creuset pans since I’m not allowed to lift anything over 10 pounds. I’m out of work until November 30th which is a good thing. Anytime I feel bad about that, I sneeze and then remember I have a lot of healing still to do and I don’t want to do this again. But I would. If it meant Derek got a new liver, I would have 100 surgeries. I would have a Groundhog Day that consisted of only waking up in the PACU at Lahey after having major abdominal surgery. In the moment, when I’m in pain or uncomfortable, I curse my wounds. I complain and I am grumpy. Like right now, as I’m typing this, I have a little cramp in my side that jabs me every time I breathe in too deep and it’s super annoying. Ask me if I would live with this forever if it meant Derek got to have a new liver? Yes. Whenever I think about the transplant waiting list, and I imagine what our lives would be like right now if Derek were still on that list, waiting, getting sicker, clinging to hope, and I just feel so sad. Because there are at least 120,000 people right now waiting. Let’s imagine that each of those 120,000 people has just 2 very close loved ones or friends that are worrying about them. That’s at least 360,000 people that are waiting. When Derek had to wait for his forever liver, after the little liver that could just couldn’t anymore, all of you that read this blog were waiting, and the people you told his story to, they were waiting. That bumps up the 360,000 to a number that’s hard to imagine, and since I’m bad at math I won’t attempt to wager a guess. The list is too long and waiting for an organ is a special kind of torture I wouldn’t wish on anyone. This Thanksgiving, when you’re gathered with your friends and loved ones for what I hope is the delicious feast you deserve, please give thanks to the men and women who have chosen to be organ donors when they pass away, and the ones that give up a part of themselves while they’re still living; the heroes that work at transplant centers around the clock; the nurses and doctors and administrators that make organ transplantation possible; the scientists, medical pioneers, and entrepreneurs who are obsessed with finding a way to end the organ shortage, trying to make the transplant waiting list a thing of the past. 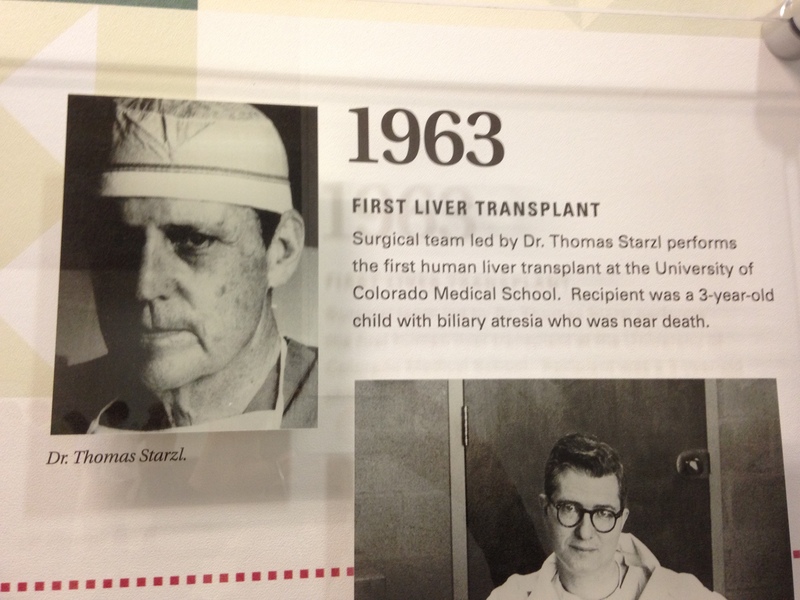 A special thank you before you dive into those mashed potatoes, if you feel like it, to Dr. Starzl who was a pioneer in liver transplants and in developing the means for patients to accept their newly transplanted organs. He was born in Iowa and was the son of a science fiction writer and a teacher/nurse and he is straight-up the most badass dude ever. If you’re reading this and you know Derek, give thanks to him too, for taking the gift of a second chance at life and turning it into something inspirational by sharing his story and for living his life like he’s always wanted to. And finally, thank you for hanging in there for this 3000+ word blog post. Derek ran his first ever half marathon! Logan – you had me laughing and in tears at the same time while reading this update. Well Done! Love to you both. Logan, you are amazing – you always seem to come through with flying colors! 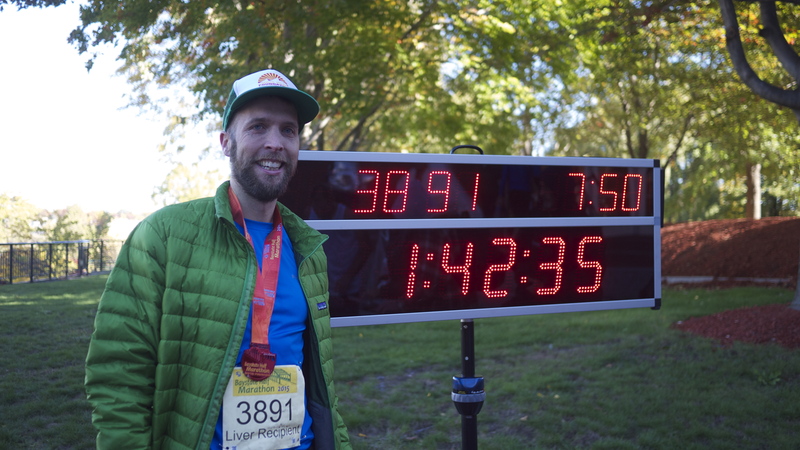 Derek, so glad you did the half marathon. Love both of you very much. Slow reader here with praise and pause. First person and seamless writing made the 3,000 words fly by. Theatre of the mind. So honored to have you as my daughter. Your taking (almost said “carving out”) the time to keyboard your narrative is appreciated and treasured. So glad you are both well. Miss you. Keep pluggin’ away.